Chinese society has changed so much over the past three decades that it has been difficult for peoples’ emotions, spiritual and moral beliefs to keep up. Throughout much of the economic reform period of the late 20th century, the focus was squarely on economic development. Now, as China has reached a milestone of becoming the world’s second largest economy and on its way to becoming the first, a growing number of Chinese are seeking more than just economic advancement. Spiritual and religious activity is on the rise. This brings up a number of extremely sensitive issues as the Communist Party regards all unofficial religious activity as a direct challenge to its authority. Hundreds of under-ground churches have been closed, dissident priests, imams and all variety of spiritual leaders have been jailed in recent years. Yet despite the government’s unwavering insistence to assert control over Chinese religious institutions, there has been a surge of interest in recent years, particularly among young people, to engage with different religions. 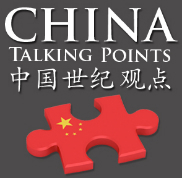 In this week’s edition of the China Talking Points podcast, Eric suggests that the new interest in spirituality, morality and religion may be born from the excesses of materialism that have come to dominate so much of contemporary Chinese popular culture. In fact, Eric contends, that large swathes of Chinese society are encountering something of a “morality crisis.” The basic premise, he explains, is that as the CCP replaced Confucianism (among other beliefs) with Communism in the period from the 1950s to the 1980s, when communism made way for capitalism, there was no spiritual companion. Instead, people began to invest their faith in to money and achievement. The only problem, he argues, is that is ultimately unfulfilling prompting millions to now look to elsewhere for spiritual development. Michael, in contrast, disagrees with this assessment. In his opinion, Chinese religious beliefs never really disappeared. They may have receded for a period of time but they were always there. Now, we are witnessing a resurgence of those deeply held religious values that have been central to Chinese life for centuries. Michael clearly rejects Eric’s proposition of a morality crisis in China. Listen to the podcast and tell us what you think. Do you agree with either Michael or Eric’s perspective? Let us know. I am sure Religion is and should be the central theme of our lives, China is NOT alone in ignoring this. I feel that Michael does not disagree with the assessment but has a good & strong religious view, ' when our lives are displaced or in crisis' we search for answers that our societies cannot offer', we ask for hopes and deeper meanings of material world and cannot find any. As humans, we cannot be simply governed by money alone, and that's what's happening not just in China but the material world. It destroys human relationship. PAST winter weather, ray ban outlet Chanel flew planeloads connected with model setters to help Las vegas for just a gathering celebrating Numéros Privés, a exposure promoting this model for the Wynn inn. ray ban sunglasses sale At this time there, family and friends as well as Diane Kruger, Jessica Alba in addition to Rachel Zoe mingled inside of a big red-lighted imitation of any black color Chanel 3. second there’s 55 tote. ray ban sunglasses outlet Although as soon as the item got time period for lunch, Chanel’s web design manager, Ruben Galantic, cheap ray bans didn’t remain for a dining room table having stars, ray ban sunglasses cheap although just one having Silicon Valley support vip's, cheap ray ban sunglasses including Marissa Mayer (wearing some sort of bleak beaded Chanel mixture dress) in addition to Alison Pincus (in a classic black color Chanel shift). http://www.celebraybanoutlet.org/. if china want to have the religious freedom, i guess the first mission is to have more speech freedom. you know, i do know even know my comment will be not allowed cause some relevant rule of the policy. And since the palette of choices is so rich and generous, we are convinced that many of you will be able to find something appropriate and totally fashionable for your own wear. We know that each bride has her own vision or image of how the perfect wunderbares Ballkleid should look like, and we truly believe that these remarkable Martina Liana wunderbare Ballkleider can make the ideal or the dream of many brides.